Covalent Network Solids are a type of Crystalline Solid which are some of the hardest materials on earth. They have very high melting points and poor conductivity. They are formed with chains of covalent bonds which form large 3D networks. Their strength is derived from these intramolecular covalent bonds. They are usually made up of either carbon or silicon, because they can form four covalent bonds with their neighbors and thereby form these structures. There are four common covalent network solids: pure Carbon (C), pure Silicon (Si), Silicon carbide (SiC), and quartz (SiO2). These can all come in different combinations and shapes. 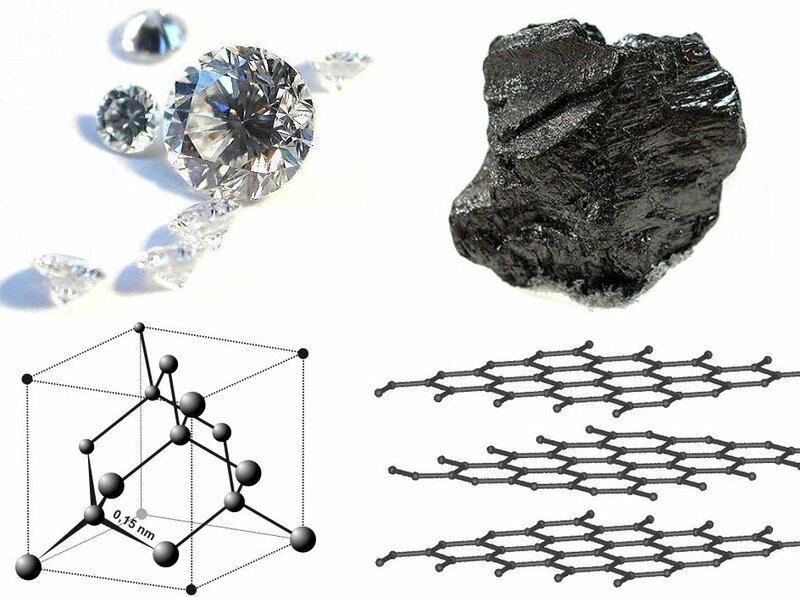 For example, Carbon is usually found in one of three forms: graphite, diamond or a buckyball (sphere-like) form. These are shown in the graphic below. The different forms of carbon vary based on the arrangement of atoms and the types of bonds between the different "layers" or "shapes." Conductivity in network covalent solids can be increased through a strategy known as "doping". This refers to when you switch out the carbon or silicon for an element either to the left or right of the periodic table. This adds or removes an extra electron into the structure which is then delocalized and moves freely throughout the entire structure. Modern transistors use this concept as the basis of their simple "on-off" switch mechanism.